I’ve spent the last week learning about Apple’s In App Purchasing process. I found a few awesome tutorials to help me get this done. For anyone else trying to learn In App Purchases programming, I recommend Ray Wenderlich, Neil North, and this Xamarin guide. The hardest lesson was that Apple will not restore purchases for subscriptions (restoring is primarily for users on multiple devices and if anyone deletes the app and reinstalls it). 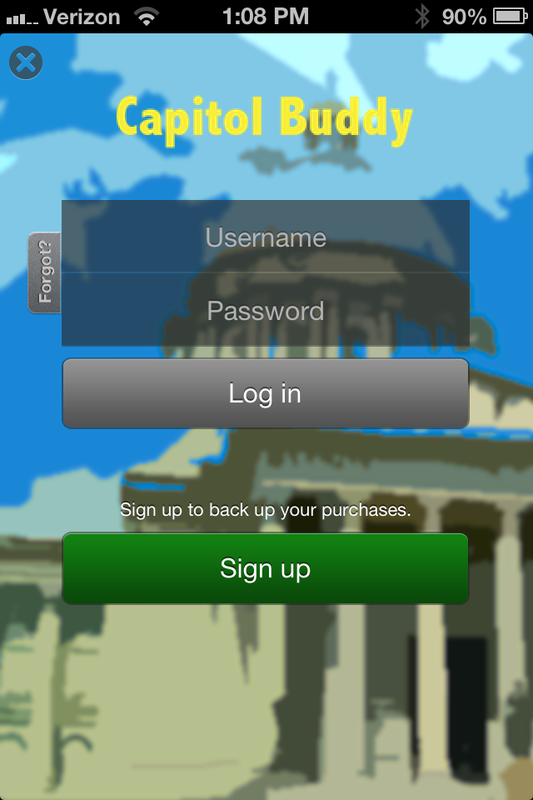 So now users will create a log-in with CapitolBuddy in order to back up their purchases. I hope to be able to sync notes in the same way. Currently, all the notes are stored locally on the device — but I think a note-syncing option is very valuable. Custom log-in screen using the parse.com SDK. Let me show off how pretty the log-in screen is. It was very easy to set up thanks to Parse.com. 1) Investigate syncing notes using Parse. 2) Invest in a good scraper to quickly grab legislator data from the internet. 3) Talk to TrakBill about collaborating. Maybe I should explain my thoughts on TrakBill a bit more. TrakBill is a service for searching and tracking bills moving through state legislatures. My thought is I could help them gain more subscribers if they give me access to their API through my app too. And maybe they’ll want to use my legislator databases — I’ve found that to be a weakness in their application. So we could both benefit from teaming up. But this whole conversation is a ways down the road — I’ve got to catch up with them first. Their app is much more sophisticated than CapitolBuddy, currently. Previous Previous post: Rhode Island is in the works.